In Sri Lanka, coconut rice is called kiribath and is traditionally the first solid food given to a baby. Lucky baby. The mixture of slowly cooked rice imbued with sticky coconut milk is delicious, either hot, as a rich accompaniment to a coconut-free curry (try it with the tempered prawns), or cold, as we ate it for breakfast. It can also be eaten as a sweet snack, sprinkled with palm sugar or light muscovado sugar. 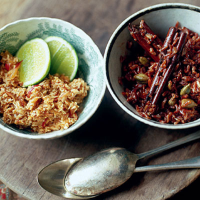 Although Camargue red rice is a different variety to the Sri Lankan red rice, it gives a similarly nutty texture and a distinctive flavour. Pol sambal, a coconut relish, appears on tables everywhere, ready to be sprinkled on rice and curry or anything that would welcome the lively blend of tastes. Serve it with some slices of lime. Mix all the ingredients for the pol sambal chutney together thoroughly, massaging the ingredients so that the coconut absorbs the other flavours evenly. Pile into a bowl ready to be served. Rinse the rice in cold water. Drain well and place in a heavy-based saucepan with the spices, 400ml coconut milk, 300ml water and a little salt. Bring to the boil, then reduce the heat, cover and simmer gently over a low heat for around 40 minutes until the liquid has all been absorbed; add a little more water towards the end if necessary. Stir occasionally and keep a close eye on the rice as it nears the end of the cooking time. Then add the remaining coconut milk and simmer for a little longer until the rice is thick and sticky and the milk has also been absorbed. Either serve straight from the pan or cold. If you prefer to serve it cold, base-line an 18–20cm square tin with a sheet of non-stick baking parchment and spread the rice in it in an even layer. Leave to cool, chill for a few hours or overnight, then cut into large diamonds just before serving. If you are serving the rice at breakfast time or as a sweet snack, a cup of traditional Sri Lankan tea from the country’s central highlands would make a wonderfully refreshing match.